Welcome to Christmastime at WDW 2016. This is our favorite issue every year. One of my favorite Christmas songs is “It’s The Most Wonderful Time of the Year” by Andy Williams. That’s certainly true at Walt Disney World. The Christmas season is truly the MOST wonderful time of the year at Disney World. And yes, I know it’s not Thanksgiving yet and we shouldn’t celebrate Christmas until after Thanksgiving, but that’s not the way it works at WDW. Christmas at Walt Disney World is all about the Sights, Sounds, Tastes and even the Smells that bring to mind Christmas memories. That’s what our Feature Articles are about. The Sights, Sounds, Tastes and Smells of Christmastime at WDW. We might even throw in a surprise or two and just a couple of pictures. Epcot is pretty much Christmas Central. The Holiday’s Around is amazing but could be a little overwhelming for first time visitors so we look at what are the must see experiences in Epcot at Christmastime. Here’s a question for you, should you splurge on the Christmas special events like the Candlelight Processional Dinner Package. We have the answer. Also in Helping Hands our good friend and Children’s book writer Russ Brown talks about visiting WDW from the UK. Wonder if he packed Wally D in his suitcase? What’s your favorite Christmas shop at WDW? You might want to consider die Weihnachts Ecke. It’s the Christmas shop in the Germany Pavilion in the World Showcase at Epcot. That’s our Best of WDW Gift shop of the month. The resort is the All Star Sports Resort, the attraction is The Legends of the Lion King show at Animal Kingdom and the restaurant is 50’s Prime Time Cafe. That’s a great lineup. 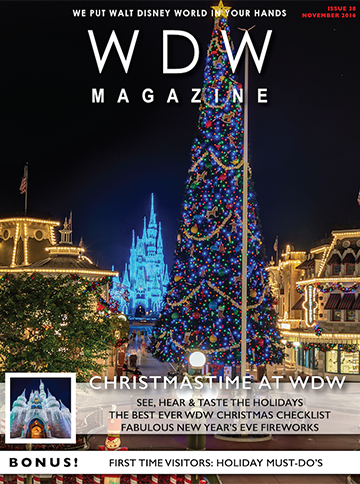 What’s your favorite thing to do during Christmastime at WDW? That was the question of the month in the FanZone. We also show you how to cook up some Clam Chowder like you’ll find at Liberty Tree Tavern. Oh, then we have Christmastime Vinylmations and Tsum Tsums. This month we have a special, Special Insert. It’s pretty cool. It’s about American History and Walt Disney World. Check it out. Look at Wally D. and Santa on the cover of this issue. Wally D. is pretty cool and leads off our section just for kids. Then the Parks children celebrate Christmastime at WDW by checking out the Storytellers in Epcot. Then we show you how to make Disney themed glitter ornaments. That’s just fun. Section k! is just for kids and this one is full of fun. Do you know what the windows of the Gingerbread House in the Grand Floridian are made of? We do. That’s one of the fun facts that’s in our Did You Know article this month. There’s also the news of the month the history facts from November and a look at the New Year’s Fireworks. Oh and we take a trip over to City Walk just to see what’s happening on the Dark Side of Orlando. Lol. Christmastime at WDW is our favorite time of the year. Have I said that yet? I hope you will celebrate Christmas right along with us.